Now into its fourth year Upstairs at the Ritzy above Brixton’s Ritzy Cinema, Catch A Fire is one of the longest running reggae nights in South London. On the first Sunday every month we bring together the best in reggae on the decks with the best live reggae acts around. 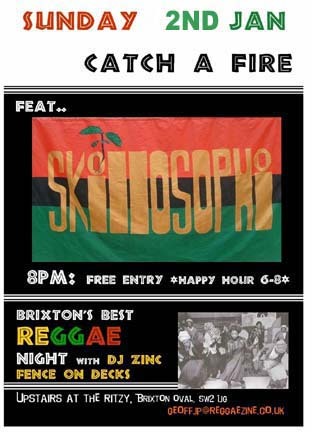 On Sunday January 2nd, Catch A Fire kicks off the New Year with Skillosophi, six piece reggae band with Skillington on vocals & guitar, Mr D on bass, Kingsley on drums, Linton on bongos, Kette and Clinton on percussion. There will also be a special PA from reggae vocalist Kingman. Zinc Fence on the decks, serving up Jamaican music from ska to dancehall. Admission free, 8-12 pm. The Ritzy Cinema, Brixton Oval, London SW2 1JG. 0207 733 2229 Brixton BR & underground, 200 yards. All Brixton Road buses.